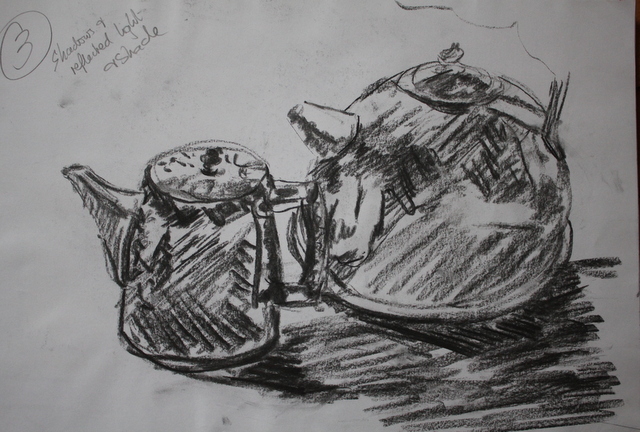 Coffee Pot and cup – I can’t say there is a differentiation between reflected and incident light -there was a minimal amount of reflection back onto the cup from the silver(ish) coffee pot and the reflection of the cup in the coffee pot- I think the mid tones have been lost a little. 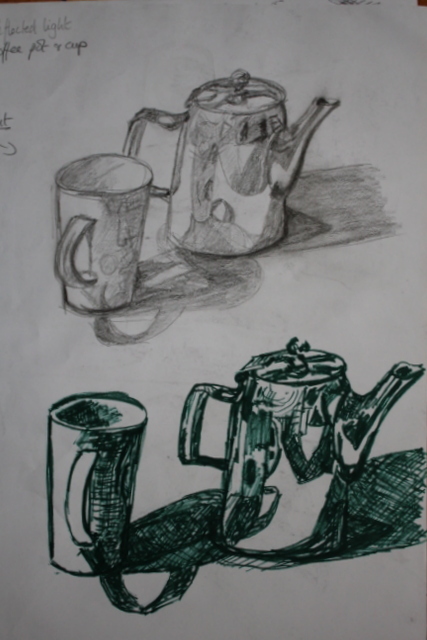 Two sketches as I couldn’t get the position on the page correct–even when I tried for the second time. 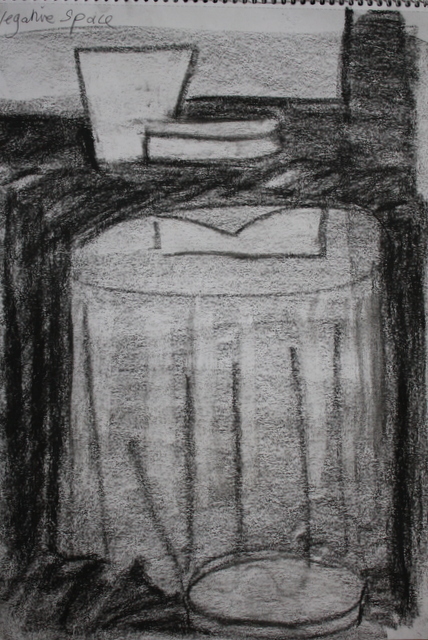 I also found medium sized charcoal too large to use to produce hatched shadowing and I changed to smaller (thin charcoal). 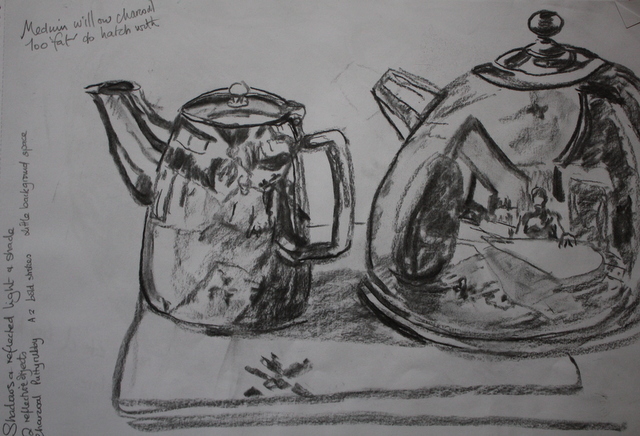 However I reverted to block shading rather than hatching as this is the way charcoal seems to lead me. 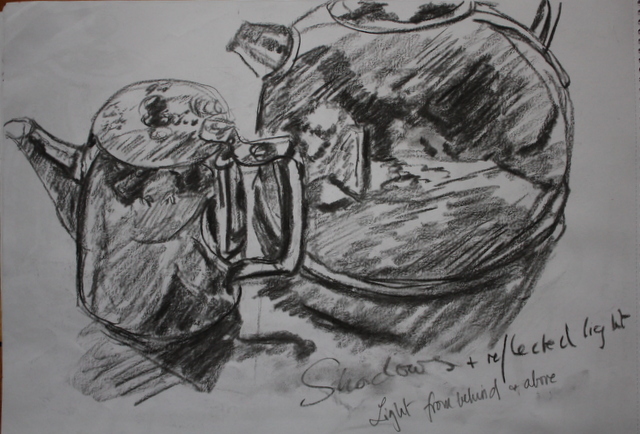 There was not only the reflection of the coffee pot in the kettle but also my reflection, that of the table and in the second drawing (done under the window) there were trees reflected in the top of the coffee pot. I am unsure how much detail was needed by the exercise. I didn’t use the rubber -until the sun came out and the light improved (but by then I had fixed the image with hair spray). 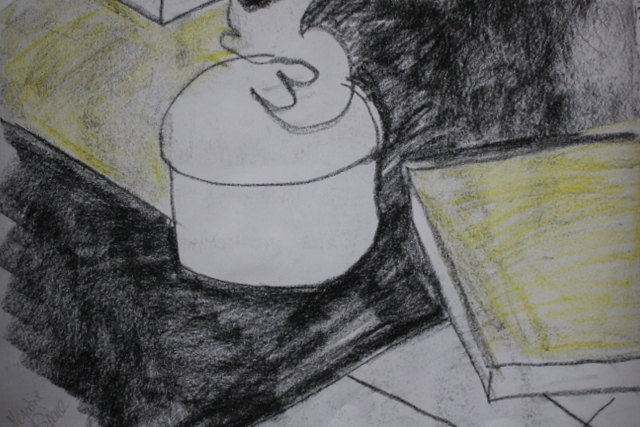 The 3rd picture was drawn again quickly to capture the sunshine and try to get the objects on the paper. Having sketched this before the position of the shadows and reflections was easier to depict and could be done quicker-I also achieved some hatching. I don’t think I quite achieved a drawing in the style of Patrick Caulfield as they are much less carefully executed (see below), although I am fascinated by his style. Research Point page 32 : Patrick Caulfield and Negative space. Patrick Caulfields prints of negative space take mundane subject matter and using the negative and the positive in contrasting bright colours produce abstract and lively pictures. Not all of his screen prints depict negative space, some are just basic outline drawings e.g of glasses or wall and roof edge with all detail removed. A blue-grey jug depicted only by an orange outline sits on a blue grey rectangle (outlined in double white lines). \the top of the vase has been angulated and its curvature changed to straight lines, there is a stylized depiction of a string of beads falling from the jug handle and a more detailed but still stylized horse headed dagger by the side -painted at an angle which does not tally with the perspective of the jug. Behind the upper part of the jug in a deep blue area is a deep brown feather like structure…I dont know what these represent, but I would think they have been inspired by the negative space behind the jug. Here the negative space is the red glow between the coals that are only indicated by a black line on a grey background. On the whole, cast shadows are on the opposite side of the object to the incident light, however reflected light may fall from one object onto another and cast a shadow in its own right. Cast shadows, because the light rays are straight, tend to mimic in shape the object although it may be shortened or elongated. A reflected light may come from a curved surface and change the shape of the original. Cast shadows may also have some of the colours of the original object thrown onto the second object. The light reflected is changed also in shape and colour. Reflected shadows and light may be visible in the reflections which are not seen from the viewer’s point of view. The reflected shadows and light follow the contours of the objects. How have you shown this in your drawing? On the whole, I have not followed the contours with the charcoal hatching or shading but have depended on the outer line and shape of the objects to give curvature. The light reflected in the pots follows these contours as per the shape of the object. The reflected shadows and light, almost produce another pictiure within a picture, the coffee pot and kettle not only reflecting in each other but also picking up reflections and light from the rest of the room. I have attempted to depict these by tonal changes and outlines.